Backed by the rich industry base and experienced personnel, our company has been able to emerge as one of the eminent manufacturers and suppliers Wrought Iron Flower. Beautifully designed, this range can easily gain the attention of everyone. Known for attractive designs, sturdy building and long service life, we offer these wrought iron flower to clients in protective packing to deliver them to clients safely. Description : Natural beauty captured in iron! 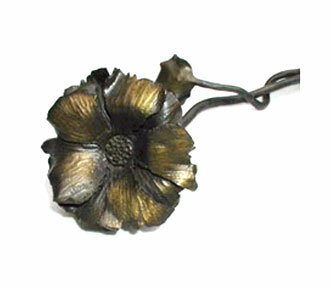 Delicately crafted wrought iron flowers, that can be used as decorative items by the fans of flowers.